28" x 22" 42" x 18"
This LED writing board is just the product to grab the attention of your target audience. Write or draw your specials and promotions. The LED writing board, also known as a bulletin board, is a blackboard display with a set of brilliantly-colored markers. The fluorescent markers on a black surface will make your text stand out. The LED writing board is perfect as a menu panel in a restaurant and could also be used in retail or service-oriented environments like hair salons or airports. Many restaurants and sports bars like to use these displays to mention their daily specials since they are always changing. 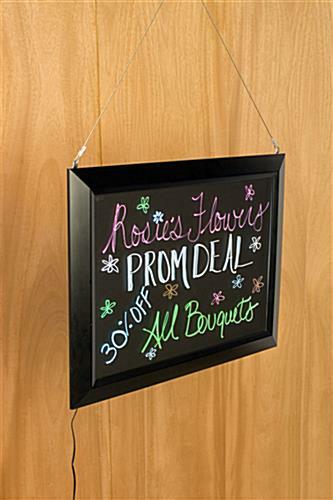 This LED writing board is the perfect blackboard for any business owner looking to communicate specials, upcoming events or promotions and more! Customize your text and phrases so that they will appeal to your customers. 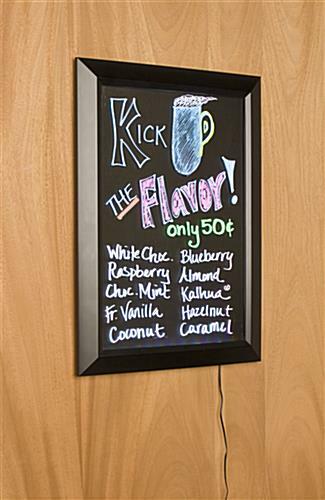 The write-on design of this LED writing board allows you to create a new, custom message as often as you'd like. 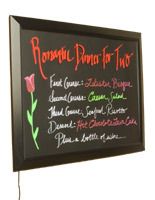 Own a restaurant and tired of letter boards as your menu board? 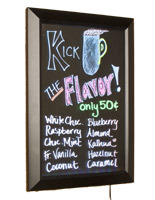 Use this LED writing board as your menu panel! 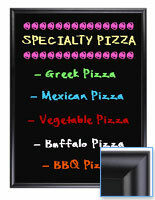 You can change your specials quickly and even add a little artwork to your menu board! This menu display, LED writing board that displays messages is an illuminated black neon bulletin board. The different illuminations allow you to select which will look best in your décor. One edge of the writing board includes red, green and blue LED lights that illuminate your written messages. 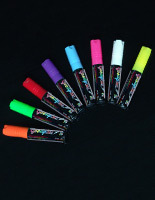 The LED writing board that illuminates includes a set of neon markers. There are eight wonderful colors to use. This LED writing board features an edge-lit construction with red, blue and green lights inside the frame. Once plugged in, you can choose from 13 different lighting effect settings for this display. Simply press the button on the frame of this LED writing board with easel to cycle through the effects. Watch the video below to see the full range of lighting effects! This LED writing board that lights up is sent with hardware for wall-mounting or suspending from a ceiling. Set up the display almost anywhere in the establishment. 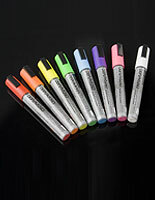 The LED writing board with markers also includes a special, non-abrasive towel to erase your custom message.